I haven't been doing any tatting for ages...new relationship, life is complicated, problems with my job, all these factors have meant that tatting has not been a priority. I think I will stop this once I finish this round because the next round is a lot of motifs needing to be made and attached, which I think will be too much for me. I can't even remember where the pattern came from! Then I have been trying to make the Rosy Ironbark book mark, (pattern on Etsy) but I am not concentrating, it will probably be just a first effort, and I will try again to get it perfect. 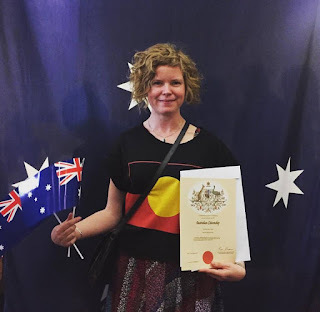 My eldest daughter became an Australian citizen last year, here she is wearing a T-shirt that represents the indigenous Australian flag, receiving her certificate. My father was also very interested by Australian plants, so for those reasons I want to make this book mark perfectly! This is the progress so far, but it doesn't look like the photo on the pattern! Something else that has caught my attention was a post on Yarnplayer's page, a Belgian tatter who has a project to build a "monument" from pink tatted squares, she explains her project here. Anyway, I have made two, neither is perfect, I need to have another go. If anyone else decides to have a go I recommend using two shuttles, because otherwise you need to use the shoelace trick to keep on the right track.